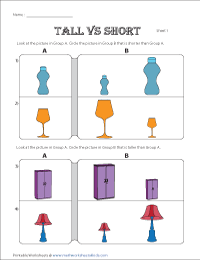 Tall vs short worksheets reinforce the knowledge in understanding sizes in terms of height. Several themes were used to realize and compare with living and non-living things in real world. Tick the tall object and cross out the short object in each section. Each worksheet has 6 practice questions. 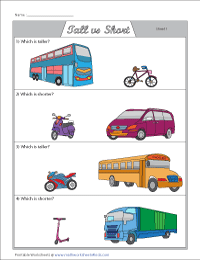 Look at the picture in section A. Circle the picture from section B that is either shorter or taller (as per direction) than picture A. Choose the taller/shorter one. 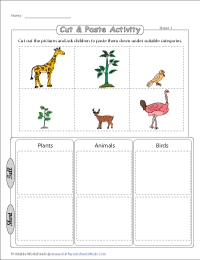 Different theme used in each worksheet. There are 3 families in each worksheet with a box under each member of a family. Compare the height and choose a tallest/shortest person from each family. You have 3 animals in each section. 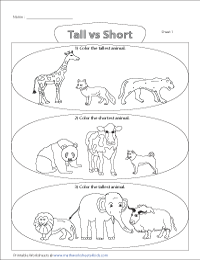 Color the tallest or shortest animal among the group. 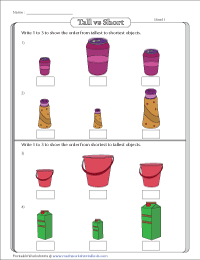 Each worksheet has 2 sections, with the first part in ordering tallest to shortest objects, and the second part in ordering shortest to tallest objects. 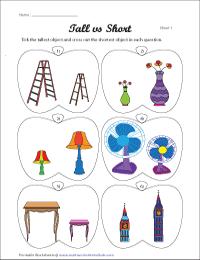 Kitchen utensil theme is used in each worksheet. Cut out the pictures and glue them under suitable category and size.